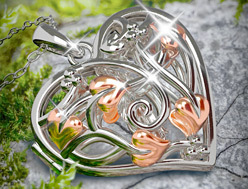 Hanging freely, and enclosed within the Tree of Life® filigree heart locket, is a 9ct rose gold fairy, protecting the wearer from harm. Also contained within is rare Welsh gold. The silver chain that accompanies this locket measures 18" (46cm) and is secured by a bolt ring clasp. Purchased this item as a valentine present. Beautiful Locket the recipient was very happy. 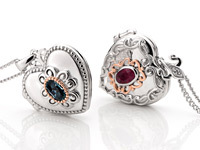 I bought the smaller locket as a beautiful present for my granddaughters christening. At the same time I ordered the bigger locket for my self and I cant tell you how pleased I am with it. It is absolutely exquisite. 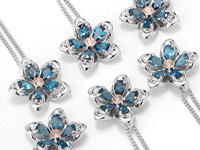 I will enjoy wearing it and I intend to leave it to my grand daughter so that when she is grown up she will have two beautiful lockets and fond memories of her grandma. 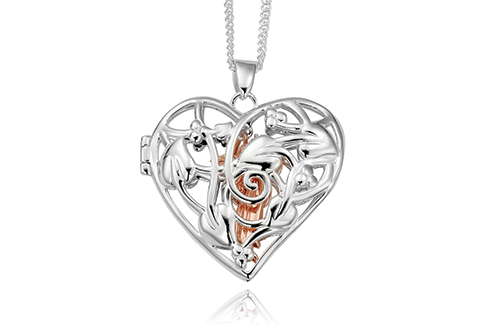 I bought this locket for my daughters birthday we were both highly delighted with it and it was even nicer than pictured on the website and the little fairy inside was very different nothing more than I would expect from Clogau as I have several pieces already. This item was beautiful. One very pleased customer, my overall rating would be five stars. Wanted it when it first came out, but have just bought it half price. Very happy with my purchase plus lots of compliments too! My husband bought me this locket for my birthday and I am very pleased with it. The silver-work is intricate and the little rose gold fairy inside is delightful! My sister was very happy! I bought the Fairy locket for my sisters 40th and judging by the phone call she was very happy! Lovely packaging and great quality jewellery. I have bought a number of items for my wife and never been disappointed. Received my locket the day after it was ordered, amazing service. The quality is wonderful, detail beautiful. I am very very pleased, my husband has made me a happy woman with this late Christmas gift. Ive loved this locket for ages. Now Imhave one for my birthday. It is so magical to,have the gold fairy inside. Amazing piece of jewellery. I adore it and show it off whenever possible. 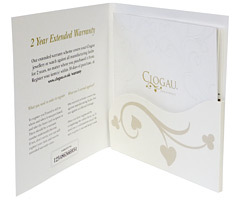 I will be buying Clogau again. The locket was a present from my husband for my birthday, it is a lovely piece of jewellery. Very comfortable to wear, with just the right length chain. 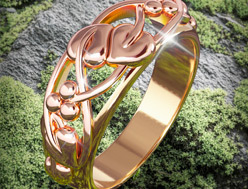 I will be buying Clogau again. Stunning and looks lovely on. The only reason I give a 3 star rating is because the chain is too thin for such a expensive locket. 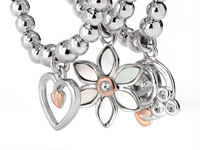 This locket is beautiful but I feel that £250.00 is too much for sterling silver. 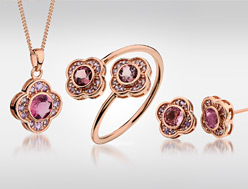 What I love about Clogau jewellery is its unique design, the fairy locket is typical, beautifully structured and a stunning piece of jewellery. I bought the Fairy Locket and also the matching Fairy Earrings as a present to my wife for Valentines Day. She absolutely loves them. She will certainly be buying more from Clogau in the future. Delighted with the product and efficient delivery via Fedex. May I suggest some padding in the box, which would improve presentation dramatically. The outer packaging is top class, but the pendant looked almost discarded in the empty box. Bought this for my wife with the matching earrings for Christmas when worn with the earrings it looks like an impressive and expensive set of matching jewellery. However the set was cheaper than 250 metres of caving rope that will only last 5 years. Back to the jewellery, it is an intricate work of art and as I said it looks impressive and expensive. My wife was very impressed with them and loves them. 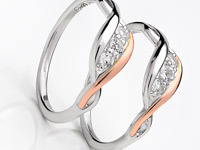 Apologies to Clogau on the earring review I only gave them 4 stars it should of been 5! lovely item, pretty, dainty, my fiance loved it. I bought this locket after seeing the advert on TV for my wife for Christmas, and I was so glad I did. It's absolutely lovely and the picture doesn't do it justice. I was impressed by the size as it is bigger than I thought, and the workmanship is second to none. Thank you. 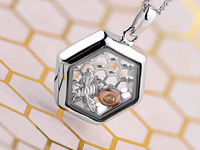 Can only say wonderful service and my wife was over the moon as she had seen it on TV but did not know I had sent for it.The only comment she made other than the locket is exquisite was that she felt the black boxes would have been nicer in a lighter colour,but this is a minor thing. This locket is a lovely piece would be nice to have adjustable chain length. I originally bought this item aboard a P&O cruise ship for my wife's birthday on 10th Oct 2013 - after several days the clasp had broken and they were unable to replace it. As you can imagine my wife was terribly disappointed but as soon as we got back to the UK I ordered the same pendant ( slightly more expensive than onboard ) I ordered it on Sunday 20th Oct and received it 2 days later. My wife is now thrilled that I have replaced the pendant and looks forward to future purchases from Clogau. My husband bought the gold fairy in silver locket for my birthday and it is fantastic and surprisingly heavy - may talk him into buying me the earrings to go with it for our Anniversary at end of August. My daughter and I fell in love with this pendant the first time we saw it. I forgot about it and then realised my daughter still hoped to have it one day. I have bought it for her 19th birthday as a surprise - it is lovely, well made and beautiful when on. I recently purchased the Fairy locket as an additional surprise for my wife for Christmas. Its a beautiful locket and the service has been superb, delivery was fast and well packaged. Thank you. My wife loves it. I purchased this locket as I had been given some money for Christmas by my father. I had previously purchased a Clogau god pendant on a holiday to Wales several years ago and have wanted another item for some time as I cherished my original item and now wanted a keepsake that reminded me of my father and was different and precious. I was not disappointed! The delivery was prompt and the locket is beautiful. The presentation box is very attractive and I will enjoy wearing this necklace for years to come. I dont think this will be my last Clogau item as this pendant has reawakened my interest in these beautiful items which contain Clogau gold and evoke memories of past holidays to Wales. As always, excellent customer service all round, fast postage. The quality of the items are best on the market. 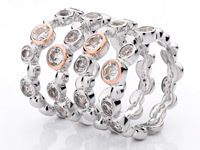 Will be back for those specials family occasions birthdays, xmas, weddings, to purchase more quality jewellery items. Fast service, excellent product and very classy presentation. In one word, wow! The locket is absolutely stunning & I will be wearing it with the matching earrings on my wedding day. Excellent customer service too. A beautiful and well made item. A gorgeous locket. Bought for my daughter as a Birthday present. It is a much loved and well worn item of jewellery. I have had my eye on this locket for ages, and decided to buy it when there was a free gift. I cant beleive the speed of the delivery, I ordered it at about 4pm and it was delivered the following day before Midday - Excellent service. The locket sits in the right place and looks lovely, a great purchase. I have only praise for the produce, service and delivery, very impressed indeed. Thank you. I bought my locket on a BA flight going to the Bahamas on the 29th of April 2011 the Royal wedding day. I was born in wales and so now I own my own little peace of it close to my heart. The workmenship is exquite. I bought this beautiful locket in my BA flight back from London. I found it amazingly detailed and unique. Im very happy with it. This is a beautiful piece..larger than expected..and the little gold fairy inside is stunning. The detail is amazing.